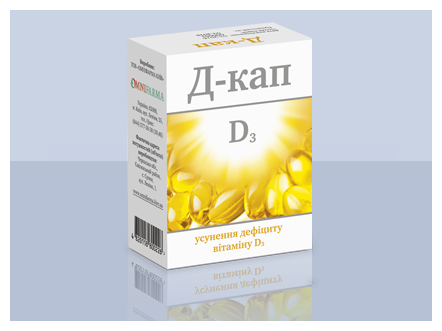 D-cap 2000 is the first Ukrainian encapsulated preparation of vitamin D based on cholecalciferol, a form of vitamin D, which is produced in the human body. What is vitamin D needed for? Vitamin D is considered to be the main biological regulator of calcium-phosphorus metabolism in the human body. Vitamin D deficiency significantly impairs the absorption of calcium from food, which is essential for the body. Normalization and maintenance of normal levels of vitamin D is an integral part of the development of healthy bones both in children and in adults. A broader understanding of vitamin D role in the body is associated with the discovery in 1979 of specific vitamin D receptors in tissues and organs not related to mineral metabolism. Nowadays, vitamin D deficiency is becoming a pandemic. In 2011, experts of the American Association of Clinical Endocrinologists and the American Institute of Medicine published recommendations on vitamin D intake. These recommendations take into account the daily demand for the population as a whole, and for high-risk groups (short-term exposure to sunlight, diabetes, overweight, metabolic disorders, malabsorption, osteoporosis, etc.). D-cap 2000 (Decap) will help eliminate vitamin D deficiency. excipients: soybean oil, gelatin (capsule shell), glycerol, purified water. recommended as a supplement to the diet as an additional source of vitamin D3 (cholecalciferol) in order to maintain its optimal level in the body. Vitamin D3 and its metabolites formed in the body facilitate the absorption of calcium and phosphorus from food and regulate their metabolism, which is important for the normal formation and growth of bones. In addition, vitamin D is involved in the regulation of the functional activity of many organs and systems, in particular cardiovascular and immune systems, digestive tract, liver, pancreas, kidneys, etc. ; it also influences metabolic processes, the synthesis of enzymes and hormones. Vitamin D3 is synthesized in the skin cells of the body exposed to ultraviolet rays (UV); therefore, the additional intake of vitamin D3 is particularly relevant in spring and during the autumn and winter period. dietary restrictions; eating large amounts of refined foods. Vitamin D3 control is important in people with diabetes mellitus, metabolic syndrome, obesity, osteoporosis, autoimmune (including rheumatoid arthritis) and dermatological diseases (including atopic dermatitis). Capsules should be taken with or after meals. On the recommendation of a doctor, the recommended daily dose can be changed individually. The duration of administration is determined by a doctor. Before usage, it is advised to consult a doctor. do not exceed the recommended daily dose. The dietary supplement should not be used as a substitute for a full diet. capsules No. 60 or or No. 120 or No. 180 (10 capsules in a blister, 6 to 18 blisters per carton). Net weight of one capsule: 480 mg±7.5%. proteins 0.12 g, carbohydrates 0 g; fats 0.34 g, 15.12 kJ / 3.61 kcal. Storage conditions: keep in original container at 10°C to 30°C in a dry place, protected from light. Keep away from children. Ukraine, 20300, Cherkasy Oblast, Uman, 31, Leninskoi Iskry Street.